Category: Expressive Arts | Sanctuary Counseling, LLC. As our roles in life shift and transform, as do the expectations and responsibilities associated with them. It’s easy to become engrossed in fulfilling these priorities for those we love, we work with, and we share a community with. In the midst of doing so, we can begin to lose our sense of self, turning to the affirmation of others to gauge our own well-being. What happens when we no longer feel present in our daily life? When the weight of all that we do for others eclipses the joy we used to feel in our interactions with them? We may no longer feel like ourselves, may feel out of touch with joy, and may feel challenged in our relationships. Often times, we aspire to get back to a state of being that we experienced before our lives became hectic, setting our sights on the past instead of the future. Finding our way through the darkness can seem daunting and yet, can be extraordinarily rewarding. Redefining and revisiting our values during this time can help reignite our flame, helping us navigate a new and healthier path forward that we are proud to call our own. Sanctuary Counseling invites you to join us and a group of other thoughtful women at our Fall 2018 Lanterns and Labyrinths Retreat held on Nov. 16th, 17th, and 18th. As part of our weekend retreat, we will explore what it means to be vulnerable, to show up in our lives with courage, and what wholehearted living can look like. We will experience expressive arts together. We will share meals together. We will make meaningful connections with others and especially with our own selves and our own stories. This three-day retreat explores The Daring Way™, a highly experiential methodology based on the research of Dr. Brené Brown. During the process, we will explore topics such as vulnerability, courage, shame, and worthiness. We will go deep to examine the thoughts, emotions, and behaviors that are holding us back and identify the new choices and practices that will move us toward more authentic and wholehearted living. The primary focus is on developing shame resilience skills and developing daily practices that transform the way we live, love, parent, and lead. Register online today at sanctuarycounseling.com! If you have any questions or concerns, please call us at 610-385-3155. In our culture we talk a lot about ‘owning who you are’, cheering others on to be vulnerable and expressive in ways that personally terrify us or feel out of reach for us. Beginning to question why we spend more time cheering others on instead of ourselves is intimidating and vulnerable work – making it easier to shy away from than to examine. We are human and vulnerability rarely offers comfort and ease – so why do it? Well, neither do silence, hiding or overexposure. Vulnerability is a sacred process of opening oneself up to experiencing and interacting with life, one small (or large) act of bravery at a time. 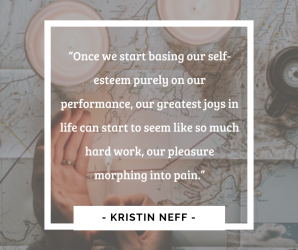 Shame and doubt thrive within our lives when we struggle to see the possibility of complete integration of who we are, including the pain and pleasure of our life stories. 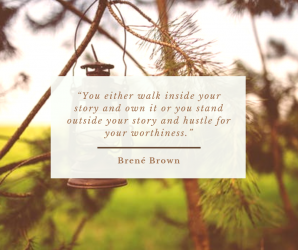 Owning our stories means being vulnerable about the truths of who we have been, what we have done and what others have done to us. Truly, it is the pinnacle of self-love and self-acceptance. Consider the reasons that many of us don’t share our complete selves with those around us: fear, guilt, embarrassment, social pressures, consequences, etc. Imagine a space where everyone around you is seeking to express themselves in way that honors their complete being – where vulnerability and truth are celebrated, connecting you with others in a profound way.